Target the root cause of a Cyanobacteria outbreak with Cyano Clean from Korallen-Zucht. 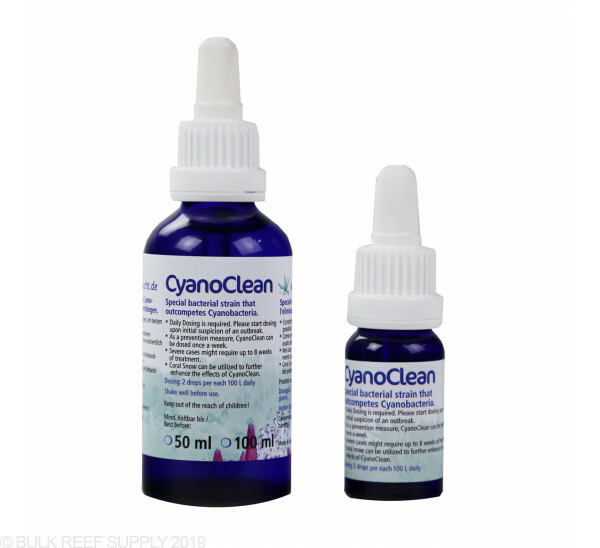 Cyano Clean’s performance can be considerably enhanced when utilized as a companion product to Coral Snow and/ or Zeozym; to safely eliminate unsightly red slime algae from your saltwater aquarium. I would recommend this product overall. PRO's : 1) It does work over time 2) side effect- reduced/eliminated Dino's CON's : 1) Effect takes 3-4 weeks to actually see results 2) felt I had to over dose alittle (6-8 drops total/day) 65g of actual water. Took 6 weeks of patience and I went a few drops over the recommended dose and all but a few small areas are gone. It takes about 2 weeks but it works. But I found that you have to ween your tank down to twice weekly to keep it gone. I've been using it on my 120 gallon reef. I dose 8 drops a day and it has not done any noticeable damage to my cyanobacteria. I'll give it another month before I use the Chemiclean. This won't get rid of a cyano problem. I had to dose Chemiclean to completely getting rid of cyano, but that then caused other issues. I'm dosing Cyano Clean on a preventative in the hopes of keeping cyano from returning. I didn't have a large cyano outbreak - I just had some stubborn cyano for a while after adding carbon. Quickly I ordered Korallen Cyano Clean from BRS and stopped the carbon. I started dosing Cyano Clean for 10 days and I did not see any improvement. Fortunately I still had some leftover of ChemiClean in the drawer. I added 1/4 of recommended dose of ChemiClean and cyano was gone in 48 hours. Now there is no cyano. Hasn't done a thing to my cyano problem. No dosing instructions. Money down the drain and I still have cyano. Hey guys who ever has a cyanno problem this is the answer you are looking for dose what it calls for and watch your skimmer do the work and bacteria clean it up for you I had a big one and this clean it all with a 10% water change. My tank it's 150 gallons so if I could do it you can do it too. used it in conjunction with A-Balance, Coral snow, Zeozym, and Bio-Mate, then progressively upped the dosage until i got to 5 times the recommended dosages, almost starved fish to death, with no nitrite, nitrates or ammonia measurable, the best it could do was a slight improvement. Stopped it, dosed Chemiclean according to instructions, skimmer went crazy, and cyano is gone. for how long? only time would tell, but disappointed with this product. First off let me state I do not run a zeo system but do have an ULNS through carbon dosing and 10% weekly WC schedule. As one of the side effects of carbon dosing, Cyano can be a big problem. I have tried other products and 3 day blackouts in the past with only temporary success. I tried using this product for 6 straight weeks with no visible change in cyano. Then I decided to try a 3 day blackout along with the kz. As with times past the blackout seemed to get rid of the cyano. I kept dosing daily expecting to see the nasty stuff to return, but it didn't! It has been 6 weeks since the blackout and I have yet to see even a trace of cyano. I am very pleased as this has been a struggle for me for 2 years and tried every other reef safe product on the market. I have always been intimidated by the KZ line, now I am confident you can use bits and pieces of the kz line with no problem. This is great on Cyano. It doesn't work over night so be patient. My 75 gallon was getting a brown algae growing on the rocks and it was starting to kill my zoas, I has tryed other products and didn't see to be making any head way. so i gave this product a try. Algae gone and zoas perked up. 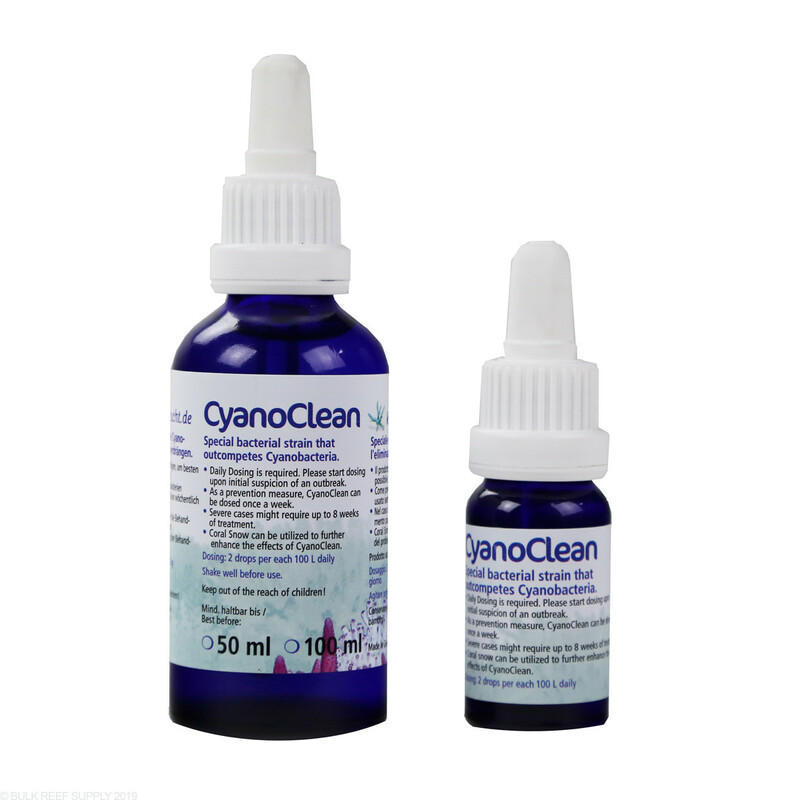 I just reordered Cyanoclean again and have been dosing along with coral snow twice a week as a prevention. So far so good. Should it be refrigerated after opening?